Allen Warren Steimling, age 93, died Friday, February 1, 2019 at the Hunterdon Care Center after a brief illness. He has lived in Pittstown NJ since 2015. Born March 21, 1925 in Rush Township PA, Allen was the son of the late Frederick and Margaret (Faust) Steimling. After the marriage to his high school sweetheart, the late Shirley Applegate, the two settled in Ringtown PA until moving to Spotswood NJ where he lived for 57 years, after which he moved to Pittstown NJ to live with his daughter. Allen was a member of the 6th Marine Division during World War II, where he served his country proudly as a high speed radio operator. After his military service, Allen became a licensed tugboat Captain and Chief Engineer from 1957 until 1976 in Port Reading NJ. He then was the Head of Maintenance for Conrail at the Port Richmond terminal, and later worked as a machinist along side his son at Steimling & Sons in Sayreville NJ until his retirement in 2009 at the age of 83. Allen was always on-the-go…whether it was being an accomplished billiards champion or taking in a round of golf at Forsgate Country Club, and later at one of his favorite casinos, Sands Bethlehem or the Mt. Airy Casino, he was always moving. 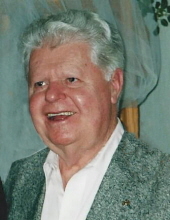 In addition to his parents, Allen was predeceased by his brothers, Jake and Duke Steimling, his sisters, Betty Beil and Margie Neifert, as well as his wife, Shirley in 1984 and his son, Allen W. Steimling Jr. in 1995. Allen his survived by his four daughters, Bonnie Brinkerhoff of Pittstown NJ, Cheryl LaPerna of E. Brunswick NJ, Diane Drust of Cheshire CT, and Erin Ammerman of Hamilton NJ, his son, Frederick Steimling of Landisville PA, as well as his sister, Jean Brill, and thirteen grandchildren and nineteen great-grandchildren. A memorial service will be held at 11:00 am on Thursday, February 21, 2019 at Holcombe-Fisher Funeral Home, 147 Main St., Flemington NJ. Interment will be private in Christ Church Cemetery in Tamaqua PA. Friends and family may gather from 10:00 am until the time of service at the funeral home. In lieu of flowers, donations in Allen’s name may be made the Semper Fi Fund at 825 College Blvd, Suite 102, PMB 609, Oceanside, CA 92057. "Email Address" would like to share the life celebration of Allen W. Steimling. Click on the "link" to go to share a favorite memory or leave a condolence message for the family.